MANILA, Philippines (AP) — Philippine President Rodrigo Duterte has described his dilemma in dealing with a more powerful China in territorial disputes in the South China Sea, saying he has few options other than to order troops to "prepare for suicide missions" if a Philippine-occupied island comes under threat. Duterte has often had to walk a tightrope when discussing China's increasingly assertive actions in the disputed waters, where Manila and Beijing, along with four other governments, have wrangled for control of territory. When he first met President Xi Jinping in Beijing in 2016, Duterte said he told him, "We are staking our claim in our economic zone and we will dig for oil in our territory." 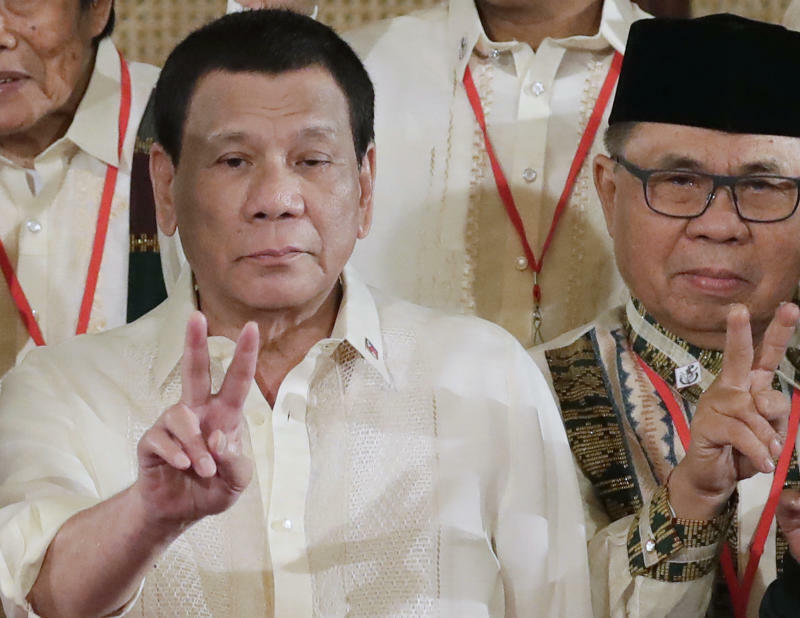 But Duterte said the Chinese leader replied that was better to hold talks first because "if you insist on your position, 'there might be trouble.'" "I had no choice," Duterte said. "If I send my navy and my soldiers there tomorrow and start to travel toward them, in a matter of seconds they'll all explode ... they will be slaughtered and the missiles that are parked there will arrive in Manila in about four minutes. Do you want a war?" Duterte said the Americans would comply with their obligations under their Mutual Defense Treaty with Manila but that they need congressional permission before going to war. "Do I trust the Americans? Yes. But will that help be on time? That's the problem," he said. He raised anew his criticism of America for failing to stop China's transformation of seven disputed reefs into islands, some of them with runways, in the South China Sea. After he took office in 2016, Duterte said the Chinese islands had become "military garrisons." "Why was it not stopped by America?" Duterte asked.